Spruce spider mites can attack a number of conifers including spruce, hemlock, white cedar (arborvitae), larch, and juniper. These mites go through four to six generations per year and populations can explode under warm, dry conditions. Spider mites feed by sucking on plant sap. Damage is more common on inner branches and areas protected from direct rain. Infested needles become mottled and appear yellowish to gray in color. Once damaged, needles will not recover even after the mites are gone. Under heavy infestations needles can brown or fall prematurely. 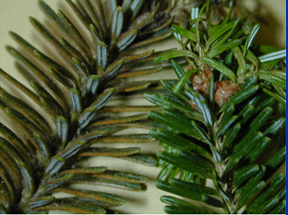 Conifers hold needles for up to four years so damage is sometimes found that represents an old infestation. 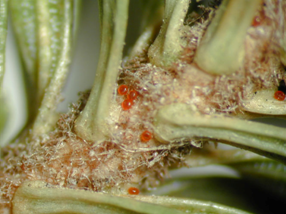 Because other conifer disorders have similar symptoms, the presence of mites or mite eggs is used for diagnosing the problem. Plants should only be treated if mites are active or if large numbers of overwintering eggs are found on shoots. Control: First determine if mites still active by shaking branches over a white piece of paper. Mites are only 1∕50 of an inch long, but can be seen walking on a light-colored background. If large numbers of eggs are observed in the fall, plants should be checked in spring for signs of activity. Most insecticides are ineffective against spider mites, and frequent use of insecticides can promote mite outbreaks by killing mite predators. Sprays containing insecticidal soap, horticultural oils or specific miticides (hexthiazox, bifenthrin) are effective controls. Heavy rain will wash mites off of plants and is a form of natural control. Similarly, a forceful stream of water can help reduce mite numbers.